The original Fanny Farmer, born Mary Watson Merritt, is best known for having standardized American cooking measurements . Instead of “1 teacup full” and “a pat of butter the size of an egg” she designed our current system of cups, teaspoons, tablespoons. She was a reluctant student of the Boston School of Cooking and later became its principal. She published The Boston Cooking School Cookbook in 1896 which quickly became “the” cookbook in America. Mary Watson Merritt is Flavorista Icon not only because of her well known achievements in improving the way Americans cooked, but because her true passion was to make the food served to people suffering from illness nutritious, comforting and delicious. Eventually, she left her position as principal to focus on her passion and ended up at Harvard medical school teaching doctors and nurses the importance of nutrition and healing. She later wrote another cookbook: Food and Cooking for the Sick and Convalescent. 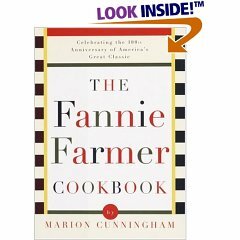 Fast forward to 1979 when Marion Cunnigham (another Flavorista Icon – please stay tuned) updated the classic to reflect the melting pot of American cooking and finally named it the Fannie Farmer Cook Book which is the ad hoc name women in the early 1900’s gave it. She updated it again in 1990. This book is a must have classic! Marion Cunningham’s chocolate chip cookies are absolutely perfect. The Fannie Farmer Cookbook aptly demonstrates the diversity of American cooking. This book has it all and it’s a great reference because it covers all the basics. I love her Buttermilk Chocolate Cake. The recipe below is one that I adapted for high altitude baking. For sea level dwellers, omit the eggs. I add the flax and wheat germ to sneak in some extra nutrition for my kids. You can easily just use 1 ½ cups flour. This is the perfect summertime cake, it is easily adorned with berries and cream or just a sprinkling of confectioner’s sugar. 3. Add wet ingredients to dry and mix well.